You know, I really wanted M. Night Shyamalan’s The Last Airbender to be good. It’s been too long since the last good fantasy action movie that I was willing to try to go easy on it because it’s a kid’s film and there’s no fun in trashing Shyamalan for his decade-long losing streak anymore, and I tried to like it, I really did. Kids and adults both seem to really love “Avatar: The Last Airbender,” the Nickelodian show on which the film is based (I assume you can guess why they had to drop the “Avatar” part), so I had hope for the story, and there was no way he’d be able to throw a pointless twist onto part one of an already written trilogy. I was right about that second part by the way, but to go easy on this film would be a disservice. You see, it turns out that Shyamalan’s ineptitude as a writer extends beyond the ends of his films. The Last Airbender isn’t poorly written like, say, The A-Team, just to name another bad summer movie, no, this one is more in line with The Room. In fact, the idea that someone read this script and said “sure, here’s three hundred million dollars,” makes pretty much the same amount of sense as someone reading The Room and saying “sure, here’s six million dollars.” At least the second financer here may have seen the comic value in Tommy Wiseau’s cult hit. People have always said that Shyamalan is a better director than a writer, but whatever hope I had for an aesthetically pleasing film went out the door the second it was converted to 3D. This is by far the worst use I’ve seen of the new technology, although, to be fair, as far as I could tell, the only time the audience in the screening reacted to anything was to laugh at the general laziness of the 3D. In the world of the film, there are four nations: air, water, earth and fire. Some people in each nation have the ability to control, or “bend” their specific element. In every generation there is an Avatar who can control the four elements and keep the world in balance, but he’s been gone for over one hundred years, and in that time, the fire nation has wiped out the air nation and began a war on the others. I can see where this premise could lead to good things. I imagined large-scale battles with thousands of warriors using elemental powers against each other. Unfortunately, the closest thing to a massive battle you get are a lot of shots of people pushing each other over with wind and easily avoiding cheap looking fireballs. The story begins with Katara, one of the last remaining southern waterbenders, and her protective brother Sokka, who may or may not be a good warrior (different information is given at different times in the film) on a hunt, where they find a boy and some sort of furry dragon thing buried in the ice. After they get him home to the village, the boy, Aang, reveals himself to be both the last remaining airbender and the Avatar. He ran away from his role as the Avatar before his training was complete and he was frozen in ice the entire time. The disgraced prince of the fire nation, Zuko (Dev Patel, just as dull and wooden as he was in Slumdog Millionaire) needs to find the Avatar to return home, and he begins chasing them down, After knowing each other for all of thirty seconds, Sokka, Katara and Aang set off to destroy the fire nation and bring balance back to the world. There are mishandled subplots, poorly introduced antagonists and bafflingly unclear plot points abound as Aang must learn to control water in time to stop an attack on the southern water nation, which is essentially a cheaper looking version Minas Tirith from Return Of The King. The problem here isn’t in the plot, which is basically standard children’s fantasy fare, but the dialogue. There are interactions abound like this one between an earthbender and Katara: “The fire nation took this scroll from your waterbending village” “Oh, a waterbending scroll!” Each character is like a cheap toy with about four lines that they repeat over and over again as if the audience had already forgotten that little bit of exposition. The characters don’t show their emotions, but rather explicitly state exactly how they are feeling at all moments. Of course, their feelings never actually change, so the repeating lines over and over experiment is able to hold steady through the emotional exposition as well. The sad thing is that there is some potential in the story. I’ve never watched the show, but it seems like, given decent character development and proper attention to the side plots, it could be pretty good. That just doesn’t happen in the film. I don’t think it’s a coincidence that the year’s two worst films, this and Tim Burton’s Alice In Wonderland, were both shot in 2D and converted to 3D as a cheap moneymaking tactic in post-production. Of course, it’s also not a coincidence that they are both unusual forays into massive budget filmmaking from overrated big-name directors who combined to direct one half-decent film in the last twenty years (Burton’s Ed Wood), but that’s neither here nor there. It’s time for studios to stop doing this. Based on the overwhelmingly negative reaction I heard while leaving the theater and the line of excited teenage girls already forming for the midnight showing of the new Twilight movie at 8:00, I can’t imagine this film doing very well, and hopefully that will be some sort of a wakeup call to studios. I never want to sit through another film that looks like The Last Airbender. I imagine it would be an ugly work to begin with, but the 3D takes it from unpleasant to truly unbearable. Whenever the camera moves, which is a lot, the 3D can’t keep up with it, which essentially makes the whole screen into a massive blur. On more than a few occasions, this happens when the camera is stopped and for a moment the screen is just as blurry with glasses on as it would be with glasses off. At least there was some effort to make the 3D look coherent in Alice In Wonderland. In this film it’s just unprofessional. I tried to be open to this as a kids movie, but it is insulting to the intelligence of children, and I tried to be open to Shyamalan, but it’s only further proof that he has earned his reputation as a one-trick pony (and The Sixth Sense wasn’t really that much of a trick). The complete lack of effort put into the 3D is echoed in pretty much every other part of the film and to go easy on something like that would be a disservice. As of right now, The Last Airbender is not yet rated. There’s nothing particularly objectionable. It opens everywhere July 1st. Written and directed by M. Night Shyamalan; based on the TV series created by Michael Dante DiMartino and Bryan Konietzko; director of photography, Andrew Lesnie; edited by Conrad Buff; original music by James Newton Howard; production designer, Philip Messina; distributed by Paramound pictures and Nickelodeon Movies. Running time: 1 hour 43 minutes. 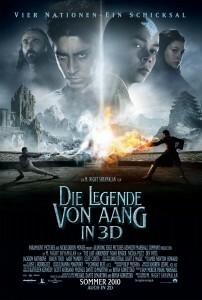 With: Noah Ringer (Aang), Nicola Peltz (Katara), Jackson Rathbone (Sokka), Dev Patel (Prince Zuko), Shaun Toub (Iroh), Cliff Curtis (Fire Lord Ozai) and Seychelle Gabriel (Princess Yue).